The Fieldrunners 2 HD tower defense game for iPad is wickedly addictive and exciting. The developers at Subatomic Studios will keep you hooked for hours with bright graphics and smart, exciting gameplay. 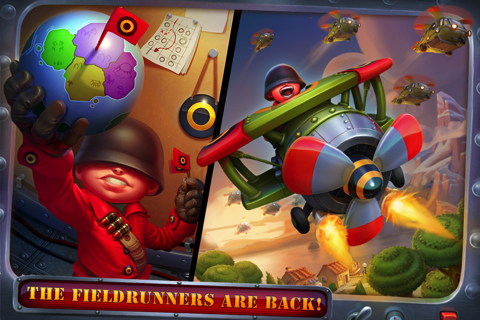 The Fieldrunners 2 HD iPad game has an efficient, yet appealing interface and navigation to quickly involve you in the game. The graphics are similar to a Pixar movie. The army men, weapons, and gamescape are distinctly unthreatening, but instead are bold, vibrant, and filled with life. As you annihilate men, you’ll notice there is no blood as they disappear. The tanks, airplanes, and weapons are reminiscent of vintage toys. The home screen for the game is neatly organized with the chance to sync with your Game Center account, as well as access settings and help. You can simply press play, and you’re greeted by a succinct pop-up explaining the gestures and strategy. You can quickly start earning points and clobbering the enemy. As you earn points, you build mazes with your towers or choose strategic locations with the best reach. Some towers have guns and rockets, but others help you slow down your enemy by shooting them with glue. As you set up mazes and earn points, you can continue to purchase enhancements to expand the reach of your tower and its ammunition. You cannot, however, move your tower once placed. You can tap on the tower to see the range, upgrade options, and amount earned from selling the tower back. If you don’t like the tower’s performance, then you sell it back for the chance to reposition or select a different tower. 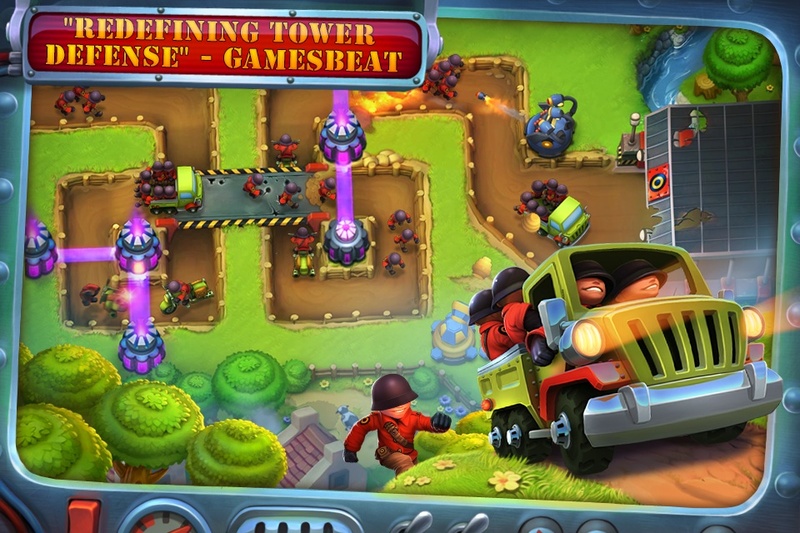 With iOS games, the gestures and gameplay can become repetitive and boring, but Fieldrunners 2 HD iPad game does not. As you progress, the enemy waves become quicker and more complicated. In turn, there is a constant change of tactical items to help you succeed. This perpetual change makes you want to come back for more. Neat features like the ability to move back three rounds and incorporate airstrikes add interest. You can also select your level, so younger children and addicted gamers have options that are satisfying and exciting. The Fieldrunners 2 HD game is priced reasonably at $7.99. The graphics are top-notch maximizing the iPad’s excellent visual display, and the ever-changing gameplay is well-planned, creative, and nicely executed. You should make sure your calendar is clear, since you will be immersed in this game and no items on a to do list will be accomplished. AppSafari review of Fieldrunners 2 HD was written by Jenni Ward on September 18th, 2012 and categorized under Action, Adventure, App Store, Featured, Games, iPad apps, Strategy, Tower Defense. Page viewed 4027 times, 1 so far today. Need help on using these apps? Please read the Help Page.